Cryptography: It is a technique of scrambling message using mathematical logic to keep the information secure. 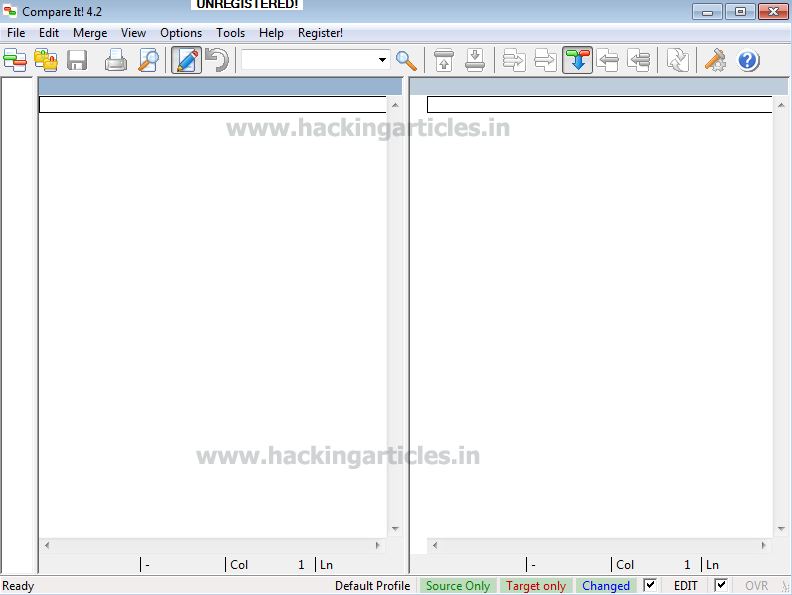 It preserve the scrambled message from being hacked when transport over unsecure network. Since it convert the readable message in unreadable text. Plaintext: It is the content of data which is in readable form that need to share over insecure network. Encrypting key: It is random string of bits created particularly to scramble the plaintext information into unreadable text using mathematical logic. There are two types of encryption key symmetric key and asymmetric key. Cipher text: The output of encryption produce cipher text which in not readable by human beings. · Authentication: It is the process of verification of the identity of the valid person through his username and password that communicates over a network. · Authorization: It refers to the process of granting or denying access to a network resource or service. Most of the computer security systems that we have today are based on a two-step mechanism. The first step is authentication, and the second step is authorization or access control, which allows the user to access various resources based on the user’s identity. · Confidentiality or privacy: It means the assurance that only authorized users can read or use confidential information. When cryptographic keys are used on plaintext to create cipher text, privacy is assigned to the information. · Integrity: Integrity is the security aspect that confirms that the original contents of information have not been altered or corrupted. There should be not any kind of modification with information while it transport over network. · Non repudiation: Non repudiation makes sure that each party is liable for its sent message. Someone can communicate and then later either falsely deny the communication entirely or claim that it occurred at a different time, or even deny receiving any piece of information. Caesar cipher is a type of substitution cipher in which each letter of the alphabet is swap by a letter a certain distance away from that letter. Step 0: Mathematically, map the letters to numbers (i.e., A = 1, B = 2, and so on). Step 1: Select an integer key K in between 1 and 25 (i.e., there are total 26 letters in the English language) let say shift right 3 alphabets where A +3 = D, B+3 = E and so on. Step 2: The encryption formula is “Add k mod 26”; that is, the original letter L becomes (L + k)%26. Step 3: The deciphering is “Subtract k mod 26”; that is, the encrypted letter L becomes (L – k) %26. Limitation: Caesar cipher is vulnerable to brute-force attack because it depends on a single key with 25 possible values if the plaintext is written in English. Consequently, by trying each option and checking which one results in a meaningful word, it is possible to find out the key. Once the key is found, the full cipher text can be deciphered accurately. It is also a type of substitution cipher in which each letter of the alphabet is swap by using some permutation of the letters in alphabet. Hence permutations of 26 letters will be 26! (Factorial of 26) and that is equal to 4x1026. This technique uses a random key for every single letter for encryption and which makes the monoalphabetic cipher secure against brute-force attack. The sender and the receiver decide on a randomly selected permutation of the letters of the alphabet. For example in word “HACKING” replace G from “J” and N from “W” hence permutation key is 2! i.e. factorial of 2 and HACKING will become “HACKJIW”. Step 0: Generate plaintext–cipher text pair by mapping each plaintext letter to a different random cipher text letter IJKLQR--------GFE. Step 1: To encipher, for each letter in the original text, replace the plaintext letter with a cipher text letter. Step 2: For deciphering, reverse the procedure in step 1. Despite its advantages, the random key for each letter in monoalphabetic substitution has some downsides too. It is very difficult to remember the order of the letters in the key, and therefore, it takes a lot of time and effort to encipher or decipher the text manually. Monoalphabetic substitution is vulnerable to frequency analysis. In this cipher a table of alphabet is 5x5 grids is created which contain 25 letters instead of 26. One alphabet “J” (or any other) is omitted. 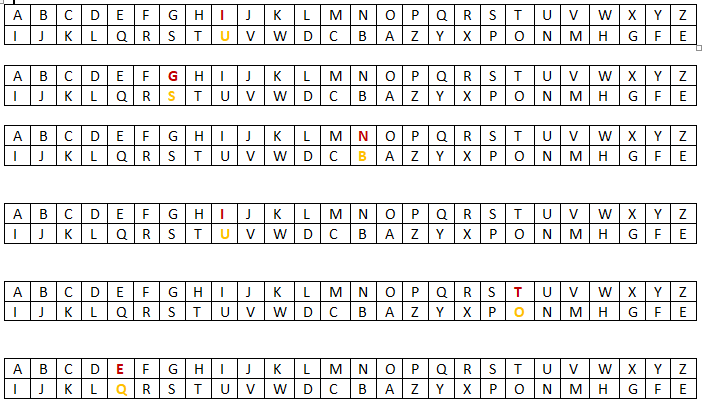 One would first fill in the spaces in the table with the letters of the keyword (dropping any duplicate letters), then fill the remaining spaces with the rest of the letters of the alphabet in order. If the plaintext () contains J, then it is replaced by I. Step 1: Set the 5 × 5 matrix by filling the first positions with the key. Fill the rest of the matrix with other letters. Let assume “ARTI” is our key for encryption. Hence encryption of word “TABLE” is “IR TN LT”. Step 3: For decryption receiver use same key to decipher the text by reversing above three rules used in step 2. 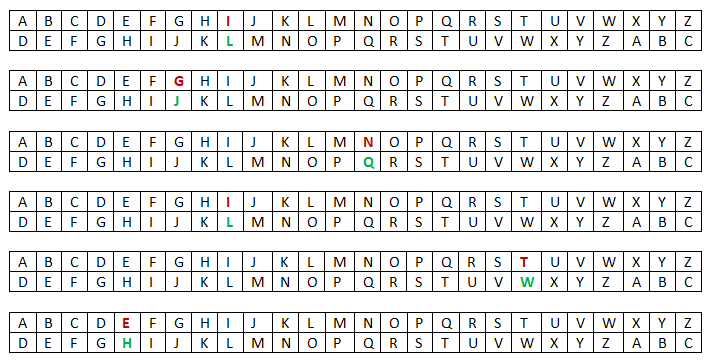 A polyalphabetic substitution cipher is a series of simple substitution ciphers. It is used to change each character of the plaintext with a variable length. The Vigenere cipher is a special example of the polyalphabetic cipher. Step 1: To encrypt, the numeric number of first letter of the key encrypts the first letter of the plaintext, the second numeric number of second letter of the key encrypts the second letter of the plaintext, and so on. The main limitation of the Vigenère cipher is the repeating character of its key. If a cryptanalyst properly estimate the length of the key, then the cipher text can be treated as link Caesar ciphers, which can be easily broken separately. Step 0: Decide the size of block for plaintext “CRYPTOGRAPHY”, let assume 6 as block size for it. · In 90o Rotation place starting letter downwards vertically from G to C and so on. 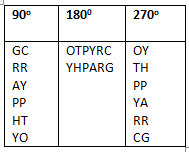 · In 180o Rotation place letter right to left horizontally from O to C and so on. · In 270o Rotation place last letter top to bottom vertically from O to Y and so on. Step 3: for decryption using block size and angle of rotation among all above three cipher texts can be decrypt. In transposition cipher plaintext are rearrange without replacing original letter from other as compare to above cipher techniques. Step 0: Decide the keyword that will be represent the number of column of a table which store plain text inside it, and help in generating cipher text, let suppose we choose CIPHER as key. Step 1: store plaintext “classical cryptography” in a table from left to right cell. Step 3: for decryption receiver use key to rearrange 26 cipher letters according to its column in 6*5 matrix. It was very easy to rearrange cipher letter if correct key is guesses. The 'rail fence cipher' also called a zigzag cipher is a form of transposition cipher the plain text is written downwards and diagonally on successive "rails" of an imaginary fence, then moving up when we reach the bottom rail. Total 10 letters are in cipher text “RHEACADELJN” and 3 rails, hence matrix will of 10*3. The rail fence cipher is not very strong; the number of practical keys (the number of rails) is small enough that a cryptanalyst can try them all by hand. HTTP authentication uses methodologies via which web servers and browsers securily exchanges the credentials like user names and passwords. Http authentication or we can also call it as Digest Authentication follows the predefined methods / standards which use encoding techniques and MD5 cryptographic hashing over HTTP protocol. 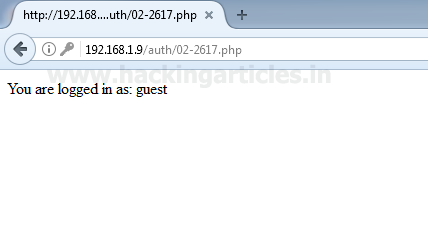 In this article we are covering the methodologies/standards used for Http Authentication. For the sake of understanding we will be using our php scripts that will simply capture user name and passwords and we will generate the Authorization value as per the standards. In basic Authentication we will be using base 64 encoding for generating our cryptographic string which contains the information of username and password. Please note we can use any of the encoding techniques like URL, Hexadecimal, or any other we want. 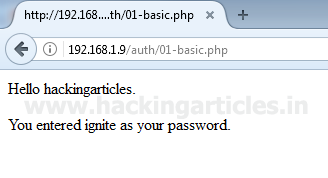 We are providing "hackingarticles" as User Name and "ignite" as password. The Authorization Value for this example is "Basic aGFja2luZ2FydGljbGVzOmlnbml0ZQ==" . This is the value which is sent to the server. Basic Authentication is less secure way because here we are only using encoding and the authorization value can be decoded, In order to enhance the security we have other standards discussed further. RFC 2069 authentication is now outdated now and RFC2617 which is enhanced version of RFC2069 is being used. provided by server and username and passwords are the input provided by client. Hash2 contains the MD5 hash value of (method:digestURI) where method could be get or post depending on the page request and digestURI is the URL of the page where the request is being sent. response is the final string which is being sent to the server and contains the MD5 hash value of (hash1:nounce:hash2) where hash1 and hash2 are generated above and nonce is an arbitrary string that could be used only one time provided by server to the client. and for more details on other parameters refer " https://technet.microsoft.com/en-us/library/cc780170(v=ws.10).aspx"
We are providing "guest" as User Name and "guest" as password. Through burpsuite we are capturing the request so that all the parameters could be captured and we can compare the hash values captured with the hash values that we will generate through any other tool (hash calculator in this case). Finally the response value obtained through hash calculator is exactly same as that we have captured with burp suit above. Cryptography is conversion of plain readable text into unreadable form. In cryptography first the data is converted into cipher text (that is encryption) and then the cipher text is converted back into readable form (that is decryption). Cryptography basically works on the concept of encryption and decryption. Encryption and decryption should not be confused with encoding and decoding, in which data is converted from one form to another but is not deliberately altered so as to conceal its content. Encryption is achieved through the algorithms. These algorithms are works with logic, mathematic calculations and its complexities. Hash Function is most important function in Cryptography. A hash means a 1 to 1 relationship between data. This is a common data type in languages, although sometimes it’s called a dictionary. A hash algorithm is a way to take an input and always have the same output, otherwise known as a 1 to 1 function. An ideal hash function is when this same process always yields a unique output. So you can tell someone, here is a file, and here is its md5 hash. If the file has been corrupted during then the md5 hash will be a different value. In practice, a hash function will always produce a value of the same size, for instance md5 () is will always return 128bits no matter the size of the input. This makes a 1 to 1 relationship impossible. A cryptographic hash function takes extra precautions in making it difficult to produce 2 different inputs with the same output, this is called a collision. It also makes it difficult to reverse the function. Hash functions are used for password storage because if an attacker where to obtain the password's hash then it forces the attacker to break the hash before he can use it to login. To break hashes, attackers will take a word list or an English dictionary and find all of the corresponding hash values and then iterate though the list for each password looking for a match. md5 (), sha0 and sha1 () are all vulnerable to a hash collision attacks and should never be used for anything security related. Instead any member of the sha-2 family, such as sha-256 should be used. Hash function plays major role in hacking/forensic world because it helps us to know whether a particular file has changed or not. You can also calculate hash value of your computer and know if anyone has made any kind of changes. To calculate hash value open Hash Calculator. 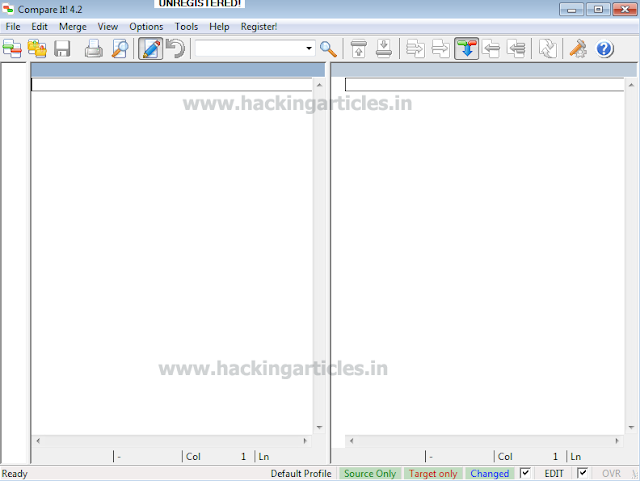 Now browse the file of which you want to calculate the hash value. And click on Calculate. After clicking on calculate it will give too hash values using four different hashing algorithms i.e MD5, SHA1, RIPEMD160, CRC32. You can check other boxes too if you want to use those algorithms to calculate hash value. This way Hash calculator helps us to know the hash value. Now if there are any changes made in this file, the hash value will change too. Once I calculated the hash value above i made some changes in the file and calculated the hash value again with the same method and as a result the hash value was changed. Now, we have two hash values. Let us compare both of these values of MD5. The value of first file is 1110808875326e25dl93e4ee096afaf1 and the value of other file is fb9d53883f302d78c978a583e8a85. Seeing these two values of MD5 of the same file we can conclude that some changes are made. Because even slightest difference will change the hash value. But now the main question is how to detect this change because a file can be of 1TB too. Also imagine that you are sending a harddisk full of important documents to someone and there is a huge possibility that someone can bribe the sender and make changes in your documents. So how can you detect these changes? The answer is very simple --> Compare it! This tool helps us achieve our goal which is to detect the change. Click file and a drop menu will appear. Select compare files option. A Dialogue box will open which will ask you to choose the files that you want to compare. Click on Browse button and select your file. And click on Open. So, in such way you can protect your sensitive data and detect the crime done too.